We were looking forward to this trip. 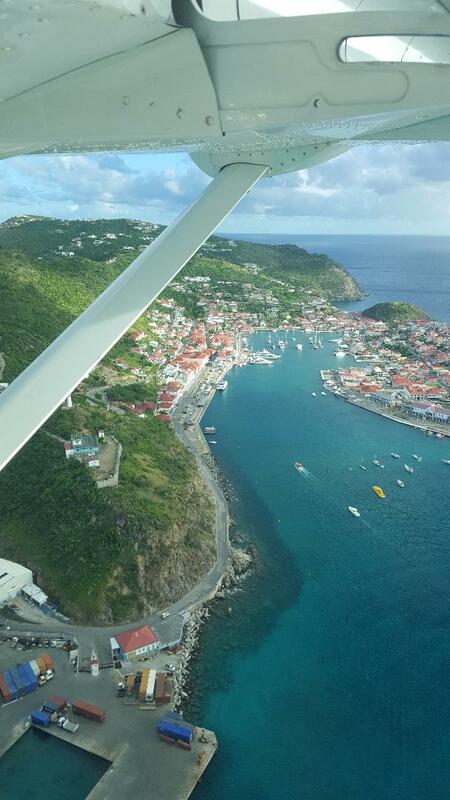 Transfer through St Maarten was easy and as usual we were excited to fly in over the harbor. Flamands Blue had slight damage from the storm, but our excellent staff arranged to have the villa repaired, cleaned, painted top to bottom inside out and it looked like a brand new place! Some of the large hotels were not yet opened but all the beaches had been cleaned and were beautiful. We spent a lot of time at the beaches this trip. We walked down the sidewalk to our favorite little pizza place in Flamands. The pizza maker is the best on the island and the thin crust is delicious. For lunch most days we got carry out and just came back to the villa and enjoyed the view. We took a 1/2 day snorkeling trip on Jicky Marine which was beautiful. This is an excellent operation and we've known the owners for years, they always take great care of our guests. Our skipper and his assistant this trip were great as usual. Several other favorites such as Le Tamarrin with the beautiful gardens. This gorgeous setting is always one of our favorites. Whie we were there we added to our night lighting making it even a little more romantic in the gardens near the Jacuzzi off the master suite. An excellent week on St Barts! Great dining, beaches and our a pic our last night in the warm Jacuzzi showing some of the night lights with the along with the full moon rising over the Flamands Hilliside.